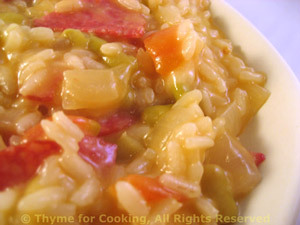 Risotto with Salami, Thyme for Cooking easy dinner. This gives me a great reason to buy salami, which I dearly love, but rarely have in the house. I get small cans of beans, which give me just 1 cup. Use more if you have a large quantity. Flageolet are like small lima beans. Cut salami in half or quarters and add to onions. Roughly chop tomato and add to condimenti. Drain and rinse beans. Add to skillet and heat through. Keep warm until needed for risotto.